Every once in a while, I'll find a railroad image that, for lack of a better phrase, stops me in my tracks. Today's POTD is one of those. 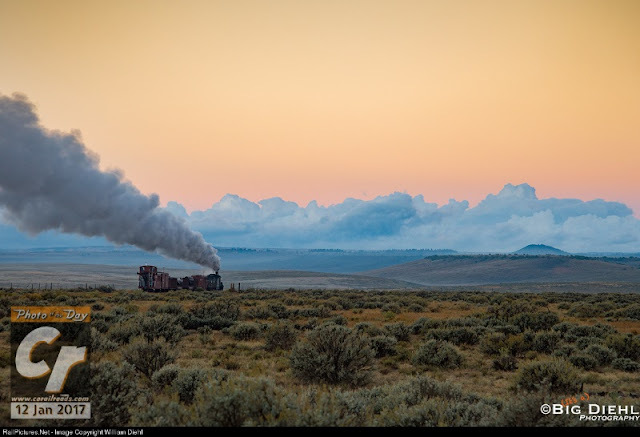 Photographer William Diehl has captured former Denver & Rio Grande Western narrow gauge Mikado on her way west out of Antonito in the fading light of September 29, 2014. The diminutive steamer chuffs off into the distance with her load of freight and a caboose on the approach to Lava tank. To fully appreciate this photo, click the photo (or this link) to view it full screen. I don't mean to exaggerate, but it appears flawless! I can practically smell the sage. Ok, that's a slight exaggeration. What isn't an exaggeration is the quality of the photo and the sense of a small train in a big, wide-open country! The Cumbres & Toltec Scenic Railroad is known for their high alpine trestles and views of Toltec Gorge, but even the broad open country it passes through as it climbs from the San Luis Valley floor can be a beauty all its own!